This luggage trailer for sale is perfect for a weekend away to carry extra luggage or the transportation of small household goods, boxes, groceries, beverages, camping equipment and loose items etc. 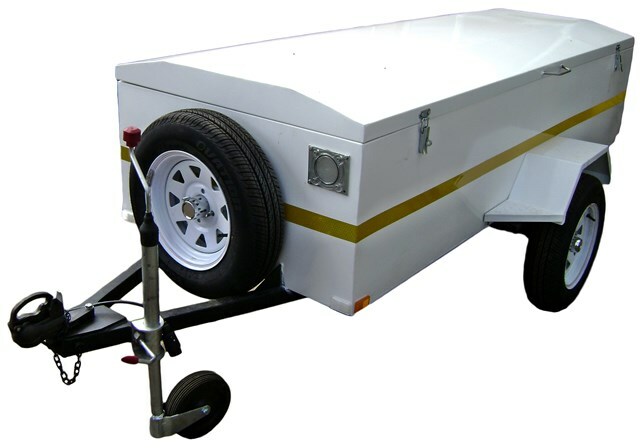 Trail Acc Trailer Manufacturers & Sales build this 2m standard length luggage trailer for sale which complies with both SABS specifications and the standards of the National Road Traffic Act, therefore quality workmanship is guaranteed. This trailer is a light duty single axle unit with a carrying capacity of 750kg. Trailer can not be used without lid. No onboard brakes. To buy your own luggage trailer of 1,8m length, contact us today for best prices. Our well trained sales staff will assist you.